The color of blood is influenced by the amount of oxygen it possesses. The closer to the arteries, the brighter the red. The further it gets from those arteries, the darker the red. 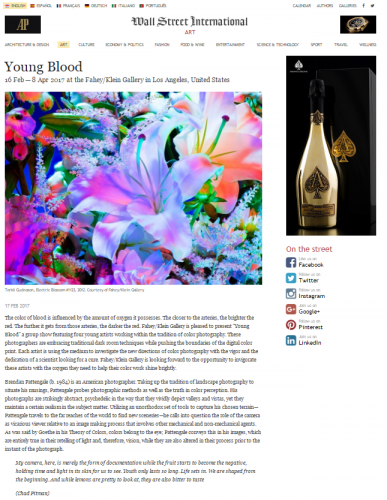 Fahey/Klein Gallery is pleased to present “Young Blood” a group show featuring four young artists working within the tradition of color photography. These photographers are embracing traditional dark room techniques while pushing the boundaries of the digital color print. Each artist is using the medium to investigate the new directions of color photography with the vigor and the dedication of a scientist looking for a cure. Fahey/Klein Gallery is looking forward to the opportunity to invigorate these artists with the oxygen they need to help their color work shine brightly.